Just a couple days ago, the world media and some bewildered journalists got a glimpse of now-departed Ukrainian president Viktor Yanukovych's villa on the Dnieper river, called Mezhyhirya. The sprawling and not-particularly-tasteful residence rests on a 345-acre lot of real estate (a little over half the size of Monaco) and features a golf course, a zoo, and an artificial lake with a ship resembling something out of Disney's "Pirates of the Caribbean" theme park ride. And it also boasts an impressive collection of about 70 cars and motorcycles. 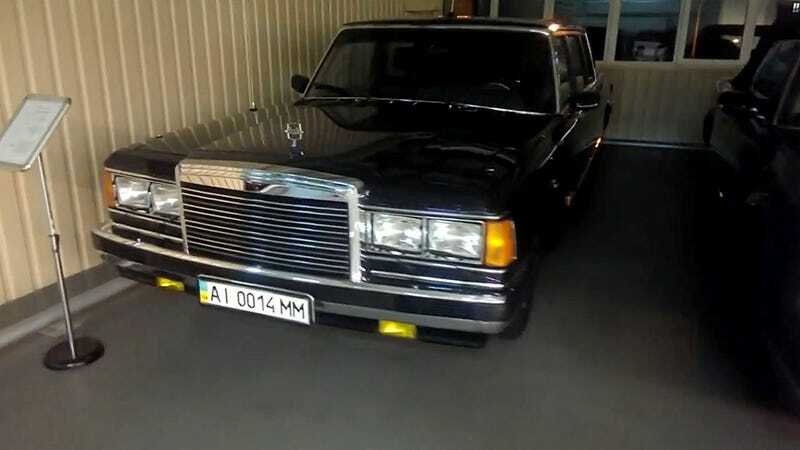 Despite the news media's reports that this was Yanukovych's private car collection, in reality this is a state-owned collection that has been accumulated since Soviet times, hence the little information placards in front of the cars, written in Russian. Some cars and motorcycles are obviously gifts from overseas or ill-considered late-night eBay purchases, but the collection appears to be well curated despite a few vulgar details on some of the cars. Due to the fact that this is a state collection, it's unlikely to be sold; even if was, it would yield only about $4 million on the open market: rarity does not equal collectibility. The collection leaves behind several GAZ M20 Pobedas, a pair of ZiLs (a 41047 is above), GAZ 21 sedans and station wagons, the latter in police livery, at least three Chaikas (and a cabriolet parade car), some prewar DKWs, and even a 1963 Chevrolet Impala. The full gallery is at Autoweek.com. For fans of Russian cars—and we're going to believe that there are definitely a few here—it's well worth the look. Plenty of products from Gorky Avtomobil'ny Zavod, for instance.